Furniture can be so easily damaged. Here are a few “easy” ways to fix some minor mishaps. • Cover it up. Fill in scuffed areas with a matching wax crayon or furniture marker. • Iron it away. To even out a dent, cover it with a damp washcloth, and iron the washcloth on medium heat. 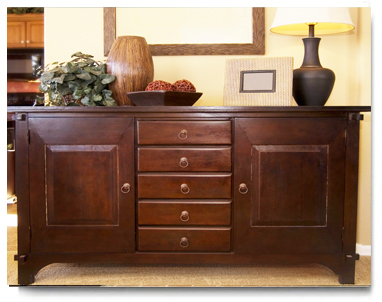 Caution: The moisture helps lift the dent out of real wood, but can damage veneers. • Ice it off. Don’t wipe off wax if it’s dripped onto a surface. Instead, let it dry, then place an ice cube in a bag on top until it hardens, and then scrape off with a credit card. • Erase it with mayo. If a cold drink or vase left its mark on your table, coat the area with mayo, leave for an hour, and wipe away the mark.